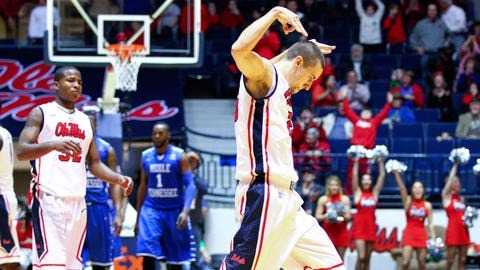 It looks like Marshall Henderson has some new tricks up his sleeve. The Ole Miss star, known as much for his brash style as his outstanding play, made a shot on Saturday that defies description, but we’ll try anyway. After receiving a pass from the top of the key, Henderson fakes a shot, takes a dribble and then whips a pass inside — where it bounces off one defender’s hands into a second defender’s chest … and up through the rim. It’s as nutty as it sounds, just watch for yourself below.